If you are looking for information on the Who's Who Magazine franchise business opportunity, Who's Who Magazine franchises or Who's Who Magazine franchising , then you have come to the right place. What is a Who's Who Magazine? Who's Who Magazines are a unique brand of bi-annual, city-oriented publications featuring a city's most respected businesses and nonprofit organizations. Through our emphasis on quality pictures, graphics and writing, we provide a medium of recognition for community leaders and, as a result, each issue's content provides long-time residents and area newcomers alike with a resource for obtaining services, business and social networking and "keeping up" with the movers and shakers in their communities. Publishing a magazine is a complex business that requires creative talent and years of experience. Our system works with the novice who has little or no publishing experience. The Who's Who concept is a comprehensive system that provides ongoing training, support and guidelines for franchisees. If you are a "people person" who is enthusiastic and able to establish long-term business relationships, then Who's Who may be just for you. Business owners should be eager to greet each day and build a successful business. You must be professional and have a desire to create positive change. You also need to have the skills to manage a proven business system including analyzing data, selecting quality editorial content and meeting deadlines in addition to organizational skills. It is also necessary to possess basic computer skills and have a general knowledge of applications. As a Who's Who franchisee you will be in business for yourself but not by yourself. You will have the ability to control your own income and create job security for you and your family. You will take pride in the ownership of your publishing business and provide a valuable service that will improve people's lives. Through Who's Who you will be creating a voice in your community that will bring people together. A website for your city to bring local attention to your business and attract new advertisers. A template design for the front cover of the magazines--you provide the cover photo. Assistance and training for your graphics person on how to successfully layout your magazine. Consulting services available to you five days a week. A detailed, user-friendly operations policies and procedures manual for quick reference. A training program to assist you in building a strong foundation with timely results. Assistance in distinguishing roles and responsibilities. A required sales training program with on-going training. Business promotion - how to approach potential advertisers and get results. Bookkeeping - how to invoice your customers and keep your books. Distribution strategies that distinguish you from other forms of advertising. You may have already determined that an independent business franchise is what you are looking for and that you have the desire, determination, hard work and patience to become a successful entrepreneur. Building recognition and a reputation for quality products and services from the ground up takes time. By joining our family of Who's Who franchisees and utilizing our systems, you have the opportunity to build a business without looking unprofessional and using the costly "trial by fire" method by doing it yourself. 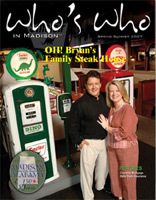 My partner and I purchased our first publication in 2003 as an investment and an opportunity to build a great business. The success of our first magazine has propelled us to purchase the rights for two additional magazines. Our first customer in Pensacola & Santa Rosa magazine was a customer from our Mobile & Baldwin County magazine that loved what the story and ad had done for him so much that he had to be in both magazines. Daniel Stephens treats all of the magazine owners like family, which contributes to the camaraderie we feel for each other and ultimately to helping us to be successful. When Image Marketing, Inc. decided to purchase Who's Who in Athens Magazine, it was actually a no brainer. 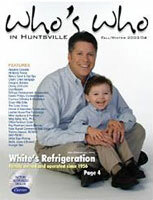 Who's Who Inc. was already an established magazine in Huntsville and with Daniel's system in place; it was a very easy and smart business decision to make! We exceeded our goal with our first edition of Who's Who in Athens Magazine, and naturally, wanting to expand, purchased three other Who's Who territories. Bottom line ... working with Daniel Stephens and the folks with Who's Who Inc. has been the wisest business decision we've ever made. Gloria Cooper, President, Image Marketing, Inc.